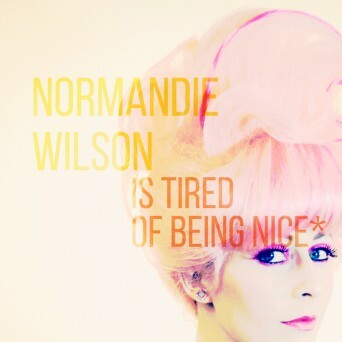 Normandie Wilson Is Tired Of Being Nice — that’s certainly an album title that announces its intentions. San Diego songbird Normandie Wilson is back with a new full length record and a brand new badass attitude. Known for her smooth laid back stylings, often compared to Burt Bacharach, Wilson is infusing her usual brand of jazzy cabaret with a punchy feminist attitude meant to empower others to do the same. Produced with David Fleminger (Manual Scan, The Answers), Normandie Wilson Is Tired Of Being Nice is a bold statement from an artist in control. The album is imbued with a new bawdy yet classy tone, inspired in part by her year working with a gay cabaret. Wilson has written about heartbreak before, but this time she’s breaking up more with a way of being than with any particular person. These songs are all about anger, revenge, heartache, and naming pain, yet the sound is still recognizably Normandie, her playful tone and effortless vocals delivering a battle cry wrapped in pink glitter packaging. Her show-stopping look, with bubblegum colored wigs and vibrant make-up, is flamboyant and clearly inspired by her time touring with the gay cabaret. Focused on the modern-day chanteuse’s experiences as a woman in the music industry and as a survivor of domestic abuse and sexual assault, it is a rare marrying of vintage jazz/pop and very contemporary feminist ideas. In it she weaves tales of rejection and resilience, producing 40 minutes of solidarity with anyone sick and tired of wearing a smile in the face of adversity. Normandie Wilson is currently in residence every Wednesday at San Diego’s historic Lafayette Hotel – stop by for a martini or check out her album on bandcamp. Posted November 23rd, 2015 & filed under Entertainment.